RE•WORK | Blog - Can AI Make Personalised Healthcare Affordable? Can AI Make Personalised Healthcare Affordable? AI is a game changer in many industries, but perhaps none with more potential to be as life changing as AI in healthcare. From medical imaging to diagnosis prediction and identification of diseases the impact of artificial intelligence in medicine will not only improve efficiency and help cut budgets, but will save lives. The lifetime risk of cancer is nearly 40%, so it’s not surprising that finding superior methods of diagnosis and treatment are in high demand. Currently, to determine an individual's risk of cancer, doctors to look at a list of factors such as age, weight, blood pressure, family medical history and more, but this approach is falling short in several areas, for example it doesn’t take into consideration any medication a patient might be on, any other illnesses or conditions they may have. Cancer strains are not uniform, for example there are 15 gene mutations for lung cancer, so it’s very important to be able to medicate each strain precisely and case by case. We need a model that gives the right treatment, at the right time, and for the right disease. At the Deep Learning Summit in Montreal, Alexandre Le Bouthiller, CEO at Imagia spoke about his work in precision medicine methods to fight cancer. In an era where medical data is exploding, working with the right healthcare data to solve the right medical problem is key to reaching patients. Patient cohorting, data curation and AI safety, alongside with the four pillars of a successful application of deep learning, will be showcased in a real-time cancer fighting application. Clinical researchers: want to get data insights and see the evolution in time. They also want a volume of data that’s statistically representative of the population because when you do clinical trials you want to make sure that your tests can be run on a variety of data that is right and for which you have multiple samples over time. Data scientist: sometimes the data is there, but the quality is poor or it’s not exactly the data you’re looking for - you want to make sure the data you’re using is representative of learnt patterns over future data. Regulator: data privacy is a big issue of course, when a patient gives consent for their data to be used for research or clinical trial, if the patient revoked their consent at any time you need to have traceability of the data so you can delete it at every point. 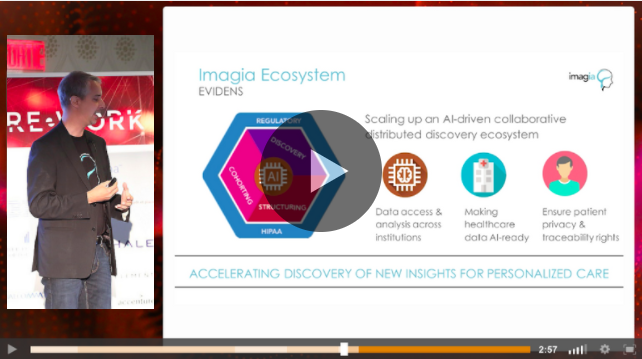 In his presentation, Alexandre goes on to explain the way in which Imagia is scaling up an ‘AI-driven collaborative distributed discovery ecosystem’ combining data access & analysis across multiple institutions, making healthcare data AI ready and ensuring patient privacy and treatability rights are handled sensitively. They’re currently working on medical imaging for biotech and pharmaceutical companies using images to see genetic information which can help to improve prediction and identification of cancer. The patterns that appear are difficult for humans to see so we combine deep learning and radiogenomics to extract imaging biomarkers. Additionally, this will help identify which drugs are appropriate for which patient and minimise the chances of people being perscribed drugs that will leads of unpleasant side effects. To hear more about how Imagia are making imaging precision medicine more accessible, you can watch Alexandre’s presentation here. Whilst we may think of cancer as being the disease that affects the largest percentage of the population, we heard from Shameer Khadeer, Program Director of ML & Data Science at Northwell Health, that by 2030, 40.5% of patients in the United States will have at least one cardiovascular illness, which will raise the total cost of cardiac care to over $818 billion. At the same summit in Montreal, he discussed the AI strategies that are helping to accelerate differential diagnoses as contribute to stratify patients for personalised treatments. He discussed examples in the context of hypertrophic cardiomyopathy, diastolic dysfunction and predicting the likelihood of being readmitted to hospital using machine learning. This research could lead to applications that both improve the clinical outcomes and reduce the overall cost and optimise healthcare delivery. To watch Shameer’s presentation and all other talks from the Deep Learning Summit, register here. To learn more about AI in healthcare, join us at An Introduction to Machine Learning in Healthcare next February 14 where you will be given the opportunity to advance your skills and discover the impact of machine learning on healthcare through training workshops, case studies and key insights.